Designation: Research Institute of Forestry, Uzbekistan. Copyright: © 2018 Khojaniyazovich MB. This is an openaccess article distributed under the terms of the Creative Commons Attribution License, which permits unrestricted use, distribution, and reproduction in any medium, provided the original author and source are credited. This article presents results of experiments on the survival rate of seedlings of the Siversa Apple tree, created by planting materials with a closed root system with different methods of planting on the western slope of the Chatkal ridge of Uzbekistan. The results of experiments have established that the highest survival rate for 2 years among the variants was observed with a deep planting at the rate of 88%. The usual and landing with the use of Carboxyl Methyl Cellulose (CMC) provided almost the same survival rate between 78.4 and 78.6%. The lowest survival rate of seedlings was observed only when planted with an open root system, where it was only 25%, which can be considered almost completely dead when creating forest cultures. Survival, Forest plantations, Planting material with a closed root system, A structure-forming agent, Plant decay. The meliorative importance of forests in the mountains of Uzbekistan, where about 90% of the territory is eroded, is very large, as forest plantations on washed-out mountain slopes perform the most effective erosion and moisture-saving functions. In this case, well-developed root systems of plantations reliably protect the soil of slopes from surface run-off of sediments. In addition, forest plantations on the washed-out mountain slopes play a large role in the restoration of the soil cover and increase the productivity of the territory. From literature it is known that the process of soil formation is closely related to the productivity of soils and the types of vegetation . However, recently natural restoration of forests and creation of forest cultures in the mountains of the country is greatly influenced by abiotic and biotic factors developed in this territory: atmospheric precipitation, unregulated grazing, illegal cutting of trees for firewood, etc. Lately, unregulated grazing on the slopes of the mountains, it led to a strong disturbance and denudation of the soil cover of the territories. Illegal logging, overgrazing, haymaking led to the disappearance of mountain forests and the general desiccation of the territories. Due to the deterioration of forest-growing conditions on mountain slopes, the effectiveness of silvicultural work has decreased significantly. According to the literature, it is known that at present the forest cover of the mountainous areas of Uzbekistan is only 3.2% . The survival rate of the forest plantations on mountain slopes does not exceed 50% . One of the main reasons for this is the extreme aridity of the climate, when high temperatures are observed in the mid-mountains in summer, above 350C, and the absence of precipitation. In summer, only 4% of the annual rainfall rate falls , which in most cases results in a large loss or destruction of forest crops planted with planting materials with an open root system. Therefore, in order to increase the survival of forest plantations in the mountains, we conducted experiments to test the methods of planting seedlings with a closed root system. In the experiment, one-year-old seedlings of Sivers apple apples grown in polyethylene containers measuring 25 X 15 cm in a substrate consisting of 75% of forest soil, 15% of manure and 10% of river sand were tested. Experience is laid on the western slope of the western tip of the Chatkal range in the territory of the Chatkal mountain-meliorative experimental station at a height of 1400 m above sea level. This slope is characterized by severe forest-growing conditions. Soil slopes refer to brown typical loess like loam, medium fertile. More than 840 mm of precipitation fell in the year of the creation of experimental forest cultures, but in the summer, the most intense period, only 29 mm fell out, which did not play any positive role, since only the surface of the soil was wetted and immediately evaporated. During this period, the humidity of the upper horizons of the soil dropped below the wilting point. Landing is made on terraces with a width of 1 m, created manually. The distance between the terraces along the slope was 3 - 4 m. The slope of the slope is -250. The planting time is the end of March, as soon as the soil has dried out after the snow has melted. 1st option: landing in such a way that the root neck was on the surface of the soil. 2nd option: planting, as in the first variant, but an artificial soil structurer - a linear colloid powder - carboxymethyl cellulose (CMC) was added to the soil that the plant was planting, which is capable of absorbing moisture in large quantities and keeping it from physical evaporation, preserving the seedlings for feeding amount of 0.02% of the mass of the soil, which is filled with a pit. 3rd option: planting so that the whole plant is in the hole where the root neck was below the surface of the soil by 20 cm and thus the root system fell deeper into the more humid soil horizons. As a control, the usual method of planting the annual seedlings of the Sivers apple tree with open roots taken from the nursery were tested – the method which is applied in production. To study the dynamics of plant survival and growth during the vegetative periods in 2013 and 2014, a continuous counting of living plants was carried out immediately after planting and in the middle of each month, with a measurement of their height with an accuracy of 1 cm. As a result of the study of plant survival, it was found that the planting of Sivers apple tree seedlings with a closed root system showed a significantly better survival rate in comparison with the planting of seedlings with an open root system (Figure 1). Dynamics of survival of Sivers apple tree seedlings with a closed root system planted on the western slope of Chatkal experimental station. Figure 1: Dynamics of survival of Sivers apple tree seedlings with a closed root system planted on the western slope of Chatkal experimental station. In the first year of planting, in all the variants of the experiment with seedlings with a closed root system, a high plant survival was observed. At the same time, the highest survivability among the variants was observed in the planting options with CMC - 100%. A good survival of the seedlings was also observed in the variants during normal and in-depth planting. At the end of the vegetative period, the plant survival rate for variants with a normal planting was on the average 81.7%, and from the deepened-90.0%, while on the control variant the survival rate was 53.4%. The significant decay of plants on this variant began already from the first decade of July (by 6.7%) and lasted until November. At the same time, on variants with a normal and in-depth planting, the decay of plants initially amounted to 3.4% and lasted until September-October. In the variants of planting from the CMC, there was no detachment and until the end of the vegetation the survival rate was preserved completely (100%). In the following year, among the variants of the experiment, the largest plant decay was observed in the control variant, where the plant survival rate was 25.0% at the end of the season. The highest survival rate was observed with a deep planting- 88.4%, which, when compared with other closed root systems, was 1.1 times, respectively, and with an open root system 3.5 times greater. This was promoted by the increased content of soil moisture during deep planting due to the location of root systems in deeper and, accordingly, more humid soil layers. The soil moisture in the root of the inhabited layer exceeded the wilting moisture by 1.2-2.2% (wilting humidity is 8%), this contributed to the provision of available moisture to the plants. The usual landing and landing with CMC showed almost the same survival rate, 78.4-78.6%. The CMC application made it possible to increase the moisture content of the soil in the root layer by 2-3% due to the retention of moisture by the helium substrate formed by the CMC swelling. The study of the growth of annual saplings of the Sivers apple tree (Table 1) in experimental forest cultures showed that in the first year of planting a good growth of its cultures was found when planting with a closed root system. 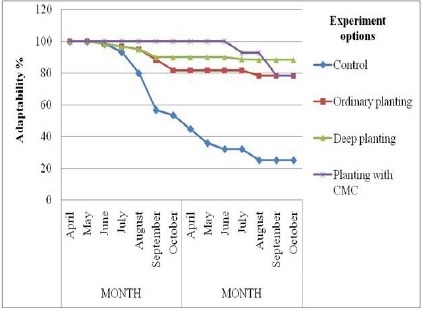 In PMKK options, during normal and in-depth planting, a higher increase was observed than in the CMC variant. In both cases, the annual increment of plants was close (10.9- 10.5 cm). Growth in height in the variants with PMZK in the first year was 3.2-3.4 times higher than the growth with the planting of seedlings with open roots (control), where the growth was 3.2 cm. Table 1: Dynamics of growth of seedlings of Sivers' apple tree in height in experimental forest cultures during the growing seasons of 2013-2014 years on the western slope Chatkal mining and meliorative experimental station. A study of the duration of plant growth showed that in the first year of planting, in all cases, intensive plant growth began in early spring and lasted until mid-summer (June- July). In the second year of the experiment, the best growth in height was observed on the PMKK version with an indepth fit. The annual increment of apple trees in height on this version has remained the same as in the first year of the experiment- 10.9 cm. On the option with landing at the usual depth, it decreased almost 3 times, amounting to 3.5 cm. On the variant with the use of CMC for the second year, the growth was reduced insignificantly, up to 5.1 cm. On the control option, height growth was practically not observed. When creating forest crops in rainfed conditions of the middle reaches, application of annual saplings of Siversa apple tree with closed roots provides a high survival rate within 78.4-88.4%. The use of carboxylmethylcellulose (CMC) structurant in the creation of forest crops on the arid mountain slopes of the Chatkal range favorably affects moisture retention in the root-soil layer by 2-3% higher than the wilting point (8%) due to the retention of moisture by the helium substrate formed at swelling of CMC. This allowed to get 100% in the first year of planting, and in the second year 78.6% of the survival rate of seedlings. The deep planting of seedlings in unfavorable soilclimatic conditions of the Chatkal ridge provided 90.0% in the first year of planting, and 88.4% of the survival rate for the second year of planting due to the location of the root systems in deeper and, accordingly, more humid soil layers. At the same time, the soil moisture in the root of the inhabited layer exceeded the wilting moisture by 1.2- 2.2%. The usual planting of seedlings with a closed root system in the first year ensured the survival rate in the range of 81.7%, and in the second year 78.4%. When planting annual saplings of the Sivers apple tree with an open root system under experimental conditions, 53.4% were obtained in the first year of planting, and in the second year only 25.0% of the survival rate. With such a low survival rate, forest cultures should be re-created. In terms of plant growth in height in the experiment, the best result was observed with a deep planting, in which the annual increment of seedlings in height in 2 years was 10.5 and 10.9 cm, respectively.